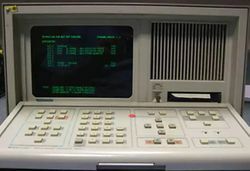 The Tektronix Digital Analysis 9100 is a Logic Analyzer system. It can have up to 104 acquisitions channels. The following cards where available for it: 91A04A, 91AE04A 91A08,91A32,91A24, 91AE2491S16,91S32, 91P16, 91P32, 91HS8 and 91HS8E. The analyzers had an optional DC100 tape drive. It was used to store Pattern generator menus, mnemonics menu and table, reference memory, and data acquisitions. There was a also an IBM software package available (91DVS). The DAS9100 can operate via the GPIB port as either a talker or a listener. It is compatible with controllers such as the Tektronix 4041, 4051, 4052 and 4054. The RS232 interface has two modes of operation. The first mode is almost the same as the GPIB mode. The controller commands the analyzer to perform functions using the same commands as for GPIB. The hardware interface works with standard modems. The second mode is a Master-Slave operation. Using another 9100 you can remotely control another 9100. The video out jack is part of option 02. This page was last edited on 25 March 2019, at 07:36.